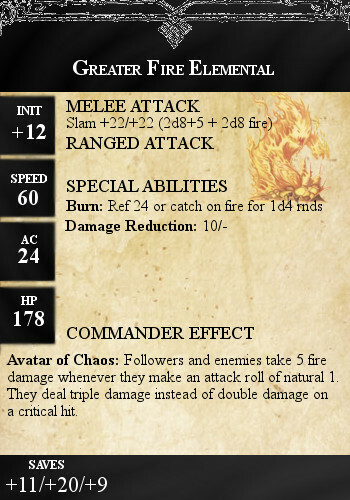 I'm currently doing some extra work on the mass battle quadrins (see bottom of post), and one of the things I've created to give myself a better overview doing the combat encounters are monster stat cards. Here's an example of a stat card I've created. Step 1 - Size: I've created a card that enables me to print 9 pieces of them out on an A4 paper. Step 2 - Background: I found a parchment background that I've used as the background. Step 3 - Theme: I found a dark banner symbolizing chaos, which is the enemy faction of the adventure that I'm creating monsters for. I will probably create a green grassy theme, sky blue theme, and other such theme for other factions of future adventures. Step 4 - Top: The top border was the hardest for me to find. I needed one that was aesthetically pleasing but also symmetrical with a center, so I could use it to center text on to the card more easily. I will probably use different borders for different factions. Step 5 - Name: I added the name of the monster at the top of the card. Step 6 - Stats: I then added relevant stats such as initiative, speed, AC, HP, saving throw, attack and damage, special abilities. I replaced level with initiative from the stat cards from the Miniature's Handbook, since I don't need level on these cards, and I added saving throw at the bottom since I wasn't sure where else to place it. The special abilities can also easily include additional features and explanations, but I've tried to keep it short. Step 7 - Commander Effect: If the creature serves as a commander of a group of enemies, that creature is given a special effect as part of the mass battle rules I'm using. 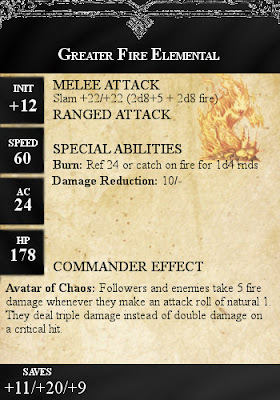 In this example the creature is an Avatar of Chaos, since it's a commander of a chaos force consisting of elementals, primarily fire elementals. I've given other commanders different effects. Step 8 - Image: As a final touch I've added an image with 50% opacity to illustrate the monster, which should make it easier for me to find a specific monster quickly when sifting through the cards. A quadrin was an old copper coin, which Webster explains was “in value [worth] about a farthing”. Its name can also be used figuratively of any tiny amount of something, or an insignificant amount of cash. I use the word quadrin to cover everything from combat encounters, non-combat encounters, events, and locations. In this case a quadrin is used to describe an amount of a small adventure, which is part of a larger campaign, thus a tiny part of the campaign. It is easier to use than “encounter” since not all parts of the adventure are combat or non-combat encounters and it thus also adds a streamlined word I can use so I don’t have to differentiate between an event, a location, and an encounter.